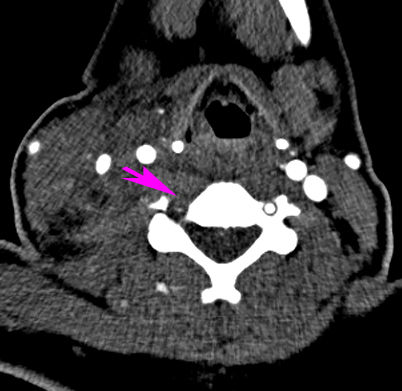 A 24-year-old woman with no significant medical history presented with a stab injury to the right side of her neck. Her physical exam revealed a penetrating neck injury, right arm weakness, and left hemi-body loss of pain and temperature sensation below C5. 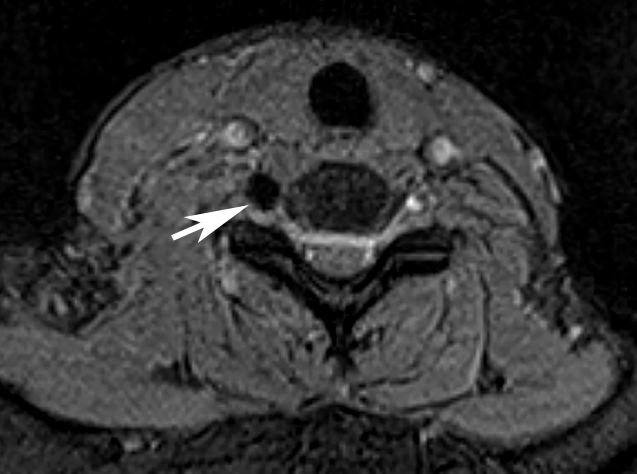 The clinical picture was suggestive of a right cervical hemicord syndrome secondary to ischemia or penetrating cord injury. On physical examination, a penetrating stab wound was identified within the right neck base at the level of C7. 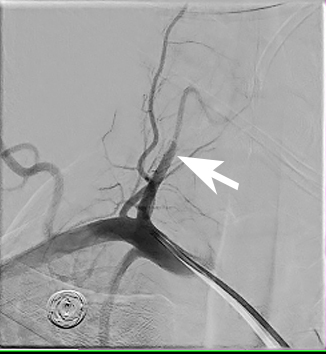 An emergent CT angiogram of the neck showed a lack of opacification of the V1 segment of the right vertebral artery (Figure 1). 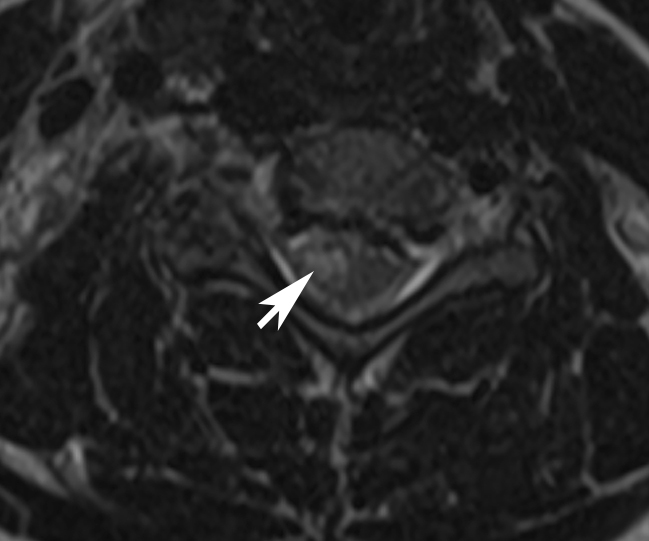 The patient subsequently underwent MRI of the cervical spine with diffusion weighted imaging (DWI) and diffusion tensor imaging (DTI). The sagittal T2-weighted images showed a focal hyperintense T2 signal abnormality within the right hemicord at the level of the C5 vertebral body (Figure 2). This lesion demonstrated restricted diffusion on the DWI sequence and involved the anterior gray, lateral gray and lateral funiculus of the right hemicord with sparing of the dorsal columns (Figure 3). DTI sequences showed a mild loss of fractional anisotropy values in the region of the infarct compared to the adjacent left hemi cord, but the fiber tracts were intact (Figure 4). 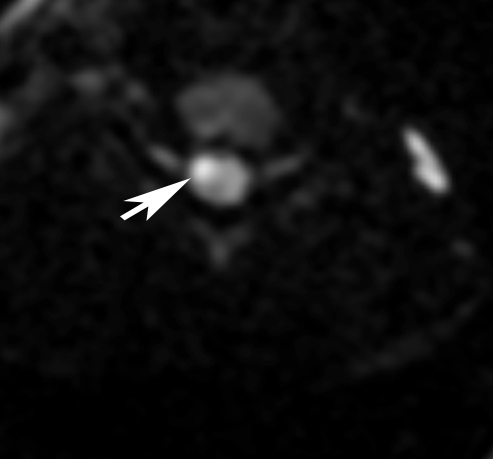 There was no evidence of blooming within the cord on the gradient echo sequence to suggest cord hemorrhage (Figure 5). 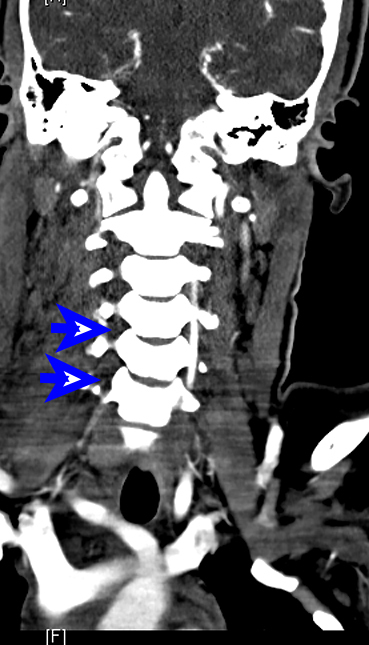 The axial T1 fat-saturated images showed an absence of the flow void of the foraminal segment of the right vertebral artery. Brown-Sequard syndrome secondary to post-traumatic vertebral artery dissection and subsequent vascular embolic stroke. The natural history of this type of penetrating dissection is unpredictable. Possibilities include recanalization with post-traumatic pseudoaneurysm, arteriovenous fistula or distal intracranial thromboembolism. 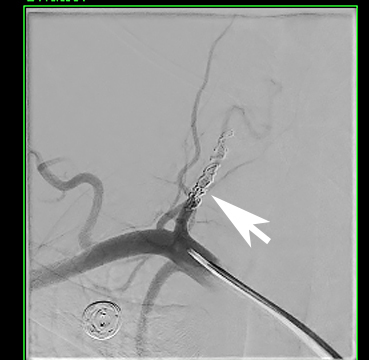 The patient was informed of the unpredictable evolution and she elected to undergo permanent sacrifice of the injured right vertebral artery via coil embolization (Figure 6). Brown-Sequard Syndrome (BSS) is an injury to the spinal hemicord. An understanding of the neuroanatomy of the spinal cord is Important to understand the clinical presentation of BSS. The descending corticospinal tracts and ascending dorsal columns decussate in the medulla while the ascending lateral spinothalamic tracts decussate within one or two levels of the entrance of the dorsal roots. As a result, injury to the hemicord results in contralateral loss of pain and temperature below the level of the insult, ipsilateral hemiparesis/hemiplegia as well as ipsilateral loss of proprioception and vibration sense. In our patient, there was no direct trauma to the spinal cord but there was traumatic dissection of the right vertebral artery. We hypothesize that the dissection might have occluded a radicular branch to the spinal cord at the level of the findings or a micro embolus might have traveled via the end arteries of the anterior spinal artery, to cause the findings in our patient. Diffusion tensor imaging relies on the differences in the 3-dimensional motion of water molecules in biologic tissue.3 Tractography is the 3D representation of anisotropy in tissues. The utility of DTI in imaging post-traumatic Brown-Sequard from indirect spinal cord injury due to a vascular insult has not been previously reported in the literature. However, DTI can exquisitely reveal the integrity of the spinal cord nerve fiber tracts. The tractography map in our patient demonstrated intact fiber tracts, but the patient had loss of fractional anisotropy (FA) on the affected side. 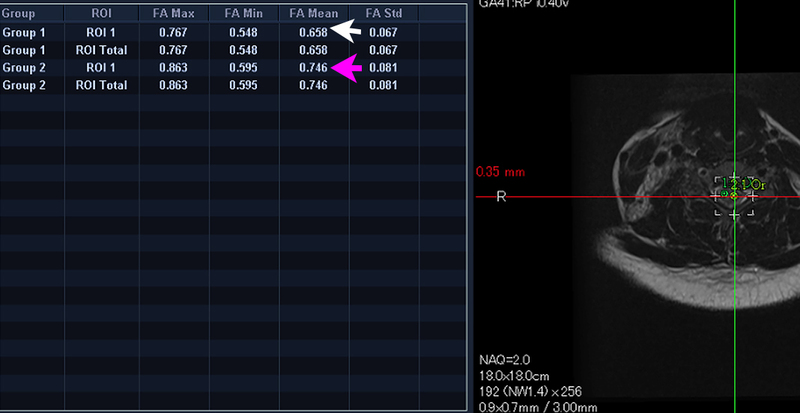 We believe the diminished FA values resulted from edema within the white matter tract from ischemia; the intactness of the fiber tracts on tractography prove that the macro-structural integrity of the nerve fiber tracts was not breached by the patient’s neck trauma. Although direct penetrating trauma to the spinal cord is the commonest cause of Brown-Sequard Syndrome, patients with ischemic insult to the spinal cord from vertebral artery dissection may present with the syndrome. A thorough clinical exam should include evaluation for Brown-Sequard Syndrome, despite the lack of direct trauma to the cord. 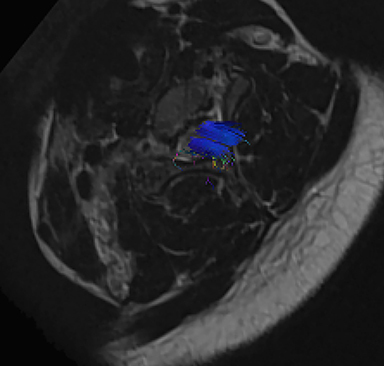 Imaging, especially MRI with DWI and DTI, can help identify injury to the cord and specifically to the nerve tracts. Peacock WJ, Shrosbee RD, Key AG. A review of 450 stab wounds of the spinal cord. S. Afr Med J. 1977; 51: 961-964. Oller DW, Bone S. Blunt cervical spine Brown-Sequard injury; a report of three cases. Am Surg. 1991;57:361-365. Rajasekaram S, Kanna RM et al. Diffusion tensor tractography demonstration of partially injured spinal cord tracts in a patient with post-traumatic Brown-Sequard Syndrome. J Magn Reson Imaging. 2010;32:978-81. Little JW, Halar E. Temporal course of motor recovery after Brown-Sequard spinal cord injuries. Paraplegia. 1985;23: 39–46. Marcel Arnold et al. Vertebral artery dissection: Presenting findings and predictors of outcome. Stroke . 2006;37:2499-2503. Babalola O, Amin K, Ree A, Gopireddy D. Vertebral artery dissection and Brown-Sequard syndrome resulting from stab wound to the neck. Appl Radiol. 2018;47(4):30-33. Prepared by Dr. Babalola while an R4 Radiology Resident, Dr. Amin while an R3 Radiology Resident, Dr. Ree while an Attending Neuroradiologist, and Dr. Gopireddy while an MRI Attending Neuroradiologist and Residency Program Director at John H. Stroger Jr Hospital of Cook County, Chicago, IL.